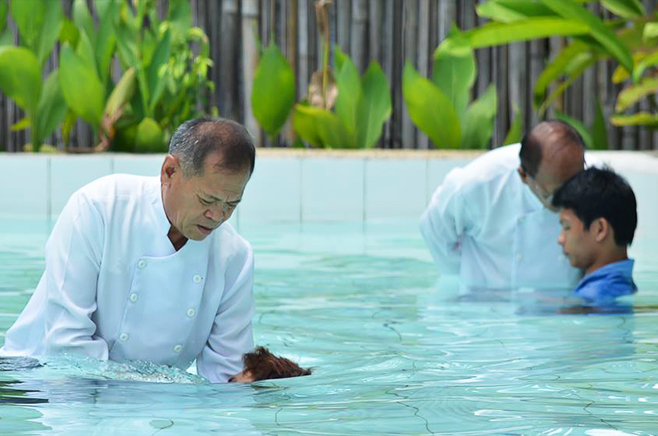 Read short testimonials of faith from some of MCGI’s youngest brethren baptized on October 31, 2014 at the ADD Convention Center in Apalit, Pampanga. First of all, when I got to listen to the teaching of Bro. Eli, I realized in my heart that all the teachings of Bro. Eli spring from his heart. I also feel and believe that it’s really God who taught him what to say to people, and to minister to all to spread the truth. It’s unlike in my previous religion wherein I really learned nothing; I didn’t know then what the truth was or how we could ever be saved from this world or the real reason behind things. I discovered the value of life through Bro. Eli and Bro. Daniel. I felt overflowing with joy inside after coming out of the baptistery. It’s like all my anger vanished, and all my sins are gone away. I am greatly thankful to God and to those who have opened my eyes, our preachers. I feel like crying whenever I see Bro. Eli crying because it’s like he’s already leaving instructions behind. But then when he smiles afterwards, it’s okay again. We want for him to be able to serve much longer that he can spread the true doctrine of God. I want to help both our preachers, God willing. I hope that Bro. Eli and Bro. Daniel will have longer lives. I also hope that all people will have great encouragement in understanding all the messages that they want the whole world to hear. I like the teachings that Bro. Eli [teaches]. My aunt lead me here. [The doctrines] make your heart feel light; your problems drift away, and you feel that you are being drawn closer to God. I really can’t explain it. The joy I feel, I can’t explain it. I’m thankful for the teachings that you have taught us. I hope that many more of our fellowmen will be able to listen to them. Sis. Veronica: We saw the true God in this organization. Bro. Carlo: I just want to add that this is also where we found the true preachers like Bro. Eli and Bro. Daniel. Their service is really to God, no deceit whatsoever. Sis. Veronica: I was confined in a hospital that had cable TV in December of 2011, when he switched the channel to [UNTV]. He said, “There, listen to that okay?” That’s when it started. Then, the reason why it took me so long a time to join is because I didn’t know that a baptism like this was needed. Before, my knowledge about the organization was just limited, until there came the Internet and Bible Expositions. So we learned how to become members. Sis. Veronica: We looked for a place where we could attend indoctrination. We’re from Ibaan, but we even reached San Jose, Batangas in our search. Then, we were told that a locale will be put up in our town. It’s God’s will that it’s already open. Bro. Carlo: We’ve actually had many attempts already at indoctrination. Sis. Veronica: We started in May, and then he had a stroke. After that, our baby got confined while we were listening to the doctrines, so we tried again in September and in October. When we were about to be baptized last time, my aunt died. Sis. Veronica: I don’t know why, but I felt like crying and crying even as I was just walking towards [the baptistery]. I just saw that my tears were falling. I guess I just really felt happy. Bro. Carlo: When they were singing the baptism hymn, I felt teary-eyed. Then, when it was immersion time already, tears just fell from my eyes. It feels good inside while I was being immersed in the pool. Sis. Veronica: It’s like there was a light shimmering inside my eyes though they were closed. Bro. Carlo: It was like it’s so bright inside your eyes. Sis. Veronica: And after you get out of the water, it’s like all you don’t see anything else, as if you were the only person there. Sis. Veronica: I’m thankful to God that they are there to guide us. Bro. Carlo: Bro. Eli, many, many thanks to God. I feel like crying. If I may just share this because lately I read on the Internet, on Facebook that he was sick. Bro. Carlo: Like he was tired already. He spent his life in serving God. I was inside the comfort room and I was crying and crying, and I didn’t know why. I was praying to the Lord to extend his life. This is where I found the true religion, the Church of God. Now when I tried it, I found that it was good. Bro. Eli Soriano isn’t kidding about the things he says, which are in the Bible, so I continued with it. I tried it out until I was able to finish indoctrination, until now that I’ve ben baptized and saw that the true religion is in The Old Path. It was in 2013 that I first got to listen [to Bro. Eliseo Soriano]. I stopped because I was having second thoughts on whether this is really the truth. Then, I listened to it again because I thought “It will be a waste if I won’t grab the opportunity, as this is also for me.” I searched for [a locale] and now I’m baptized here. Thanks be to God that He willed this to happen to me. I knew from the start that what he says is true; I believed in him. But of course, there are temptations that pull you away from the truth. Now I returned so the evil spirits that were once in me won’t come back. I hope I will be able to continue until the end. It’s quite inexplicable, as I felt good despite me having not a wink of sleep the night before. I went to [the locale] at dusk. Before that, I was tired from driving; I was also hungry at the time. But after I got baptized, it was like there’s something different about me that felt good inside. All my worries and problems were gone. I feel relieved and light. My message to Bro. Eli: May he continue preaching to people while he lives. I hope he will live longer that he may be able to help many more people who are not yet members of The Old Path [the Church of God International], that they may see and hear the truth about the Bible that is being preached by Bro. Eli Soriano.